I have a question regarding my choice of longboard. I am curently thinking about this board or the fiberfish soft. The board Im looking for should be good beginner board, mostly for cruising the city. Both boards are solid choices for city cruising. The Pinstripe with its longer wheelbase handles speed a little bit better and is more of an “all-round” choice. The Fibrefish turns quicker and has a kicktail, which might come in handy in tight spots. Im just wondering if Paris 180 would be a good match to this board, or if i should choose 150 trucks? What do you think about a setup with this board, Paris trucks and Orangatang In Heat for all around cruising. It will be a gift for a friend, she doens’t have too much experience, but she has tried out my Original Apex 37, and she’s starting to really get the hang of it. Thanks for the message Maja! We have ridden this board with both truck sizes and both work fine! With 180:s the board becomes more stable and handles speed a little bit better. With 150:s you get less risk of footbite and a more “turny” ride. 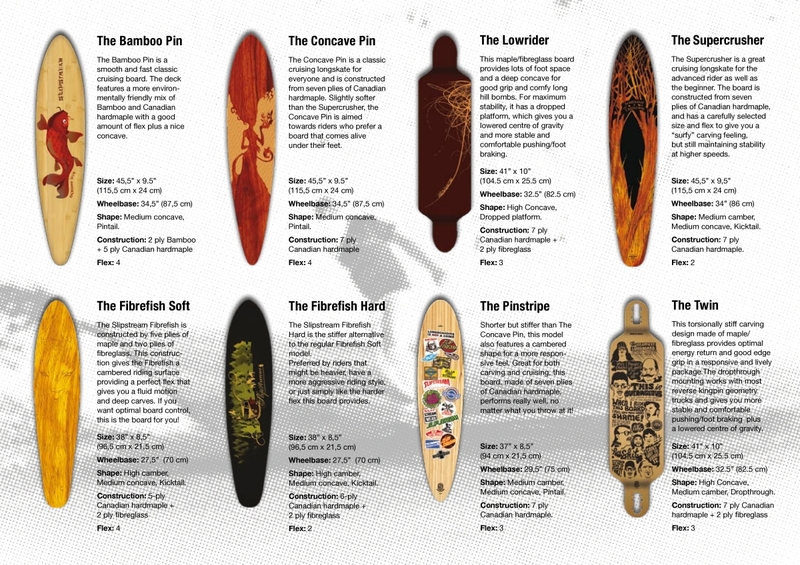 The wheels you suggest are a solid choice and this board could be the most “all round” in our quiver! Hi this looks like a super board i just love the art work and maja if you’re gonna give one of these away then i think you should get 150:s because footbites are one of those thing’s that will make you stop if it happens in the bigining and in the start you wont go so fast and thats it. Is this good for sliding? And is it the wheels, trucks or the board that makes it good for carving, sliding etc. Ludvig, The Pinstripe is pretty easy to learn slides on, naturally depending on what wheels you use. Smaller, harder and narrower wheels are easier to slide with compared to bigger, softer and wider wheels. – 180 trucks work well, but you might want to watch out for footbite in the beginning. – 75 mm wheels also work, just as long as you use riserpads to avoid wheelbite. – Wobble does not depend so much on the board in our opinion. The trucks and more importantly the bushings in the trucks are key components when wanting to reduce wobble on your setup. But most important is the skill of the rider. A skilled rider will not have issues with wobble on the same setup as a beginner wobbles with. Know your limits! That being said, this is not a “speedboard” in our opinion. – We have not tried the Original truck you mention, but it should probably be OK! Okay but i’ve already have a concave pin and i love it, but it’s time for another board and i saw the pinstripe. I love pintails and i have used my board for carving pumping and cruising but i have also tried out hills and the board it’s super stabil! I just wonder if this (the pinstripe) is a littlebit more stable at higher speeds because it’s a little bit stiffer. Am i right? Yes Mattias you are quite right, but this board is narrower and that usually reduces stability for most riders. That being said – if you enjoy speedboarding on the softer “Concave Pin”, you should probably do OK on “The Pinstripe”, but in our opinion, “The Twin” is a more stable option if stability is what you are looking for! Thanks for the messages Mattias! The Concave Pin is actually undergoing some changes for 2011. It will be a little bit shorter and stiffer. The Pinstripe can handle speeds, but as stated previously the skill of the rider is usually more of an issue regarding “wobbles”. Regarding wheelbite with the components you suggest, you should be good without risers, but that also depends on other factors as durometer of bushings, riding style, etc. Everything should be “fine tuneable” though. Exactly the same as 2010 – Do not change a winning team! Hello Again!! Sorry for asking so much, but what would you say about this setup? : Pinstripe, Paris 195s, Bones super reds(or Swiss) and Bigzigs? Is this a good setup for hillbombing and Carving at 50-60 km/h? I’m not superexperienced but i can carve pump and The basic stuff:) today for example i bombed à hill with my concave pin! My setup is Paris 180s and zigzags, My friends said that it was pretty fast around 50 km/h ihave my Paris trucks suuper loose and i didn ‘t wobble a thing!! So what I’m trying to say is that if my setup on my future pinstripe will be good for bombing hills? I hate thinking of me falling in that kind of speed that i just described. Please help me out! I’ve been riding on this board for three summers now and it’s still rolling really fine. I’m using Randal R-II 150 trucks together with Kryptonics Classic K wheels which are good for everything but sliding. I really love this board and recommend it anyone who looks for a good first board! This board and all other boards you mention are from previous seasons and really hard to find. Perhaps some will be possible to find used/secondhand but we cannot help you with that. 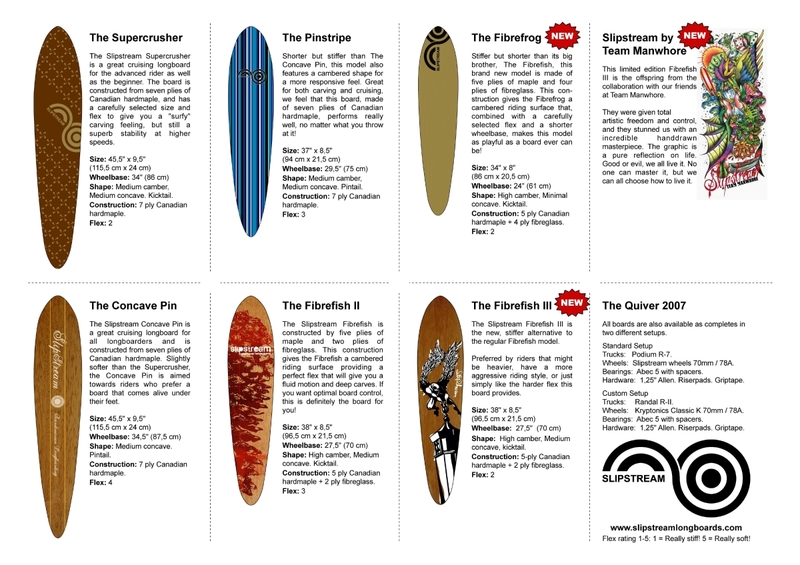 All dealers (see “Dealers” above) should have the 2011 collection though, and perhaps you could find a board you like among those? 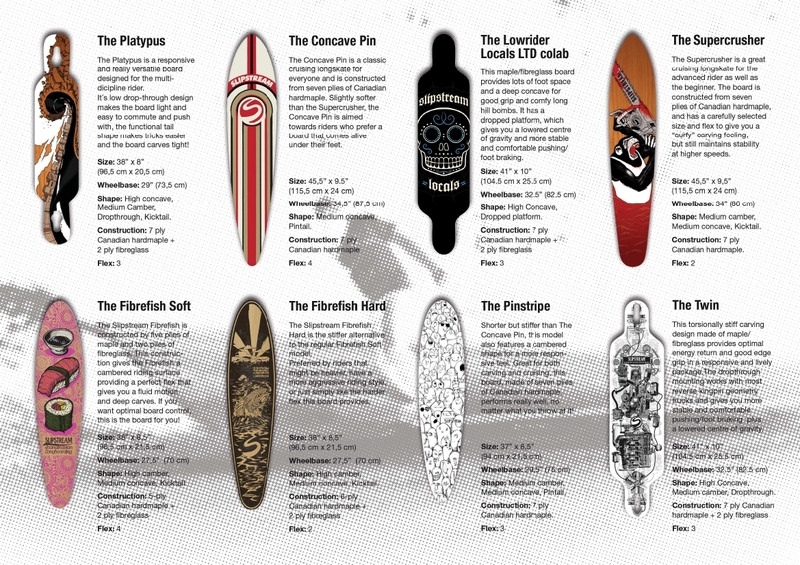 The Lowrider 2011 would probably be a solid choice for you among the boards you mention.